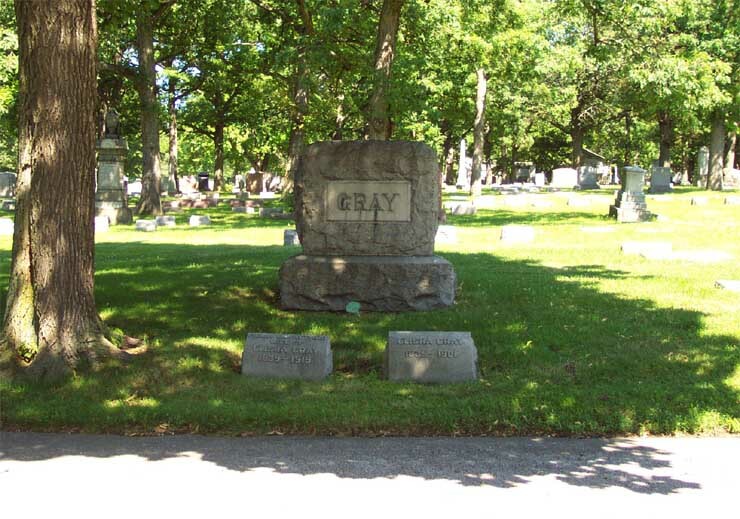 Elisha Gray was a giant in the history of telecommunications not only for his inventions (almost 70 patents), but also for founding the Western Electric Company that became the manufacturing arm of the old Bell System. When Bell Labs and Western Electric were spun out of AT&T on October 1, 1996 to create Lucent Technologies, Elisha Gray became the titular founder of Lucent. There was nothing on the Internet about the location of his grave. Fortunately Mary Gray Zajac, his brilliant great, great granddaughter and an executive at Lucent, was an old friend and colleague. She obtained clues from her parents facilitating my discovery of his grave. I dedicate these photos to her, and hope thousands of others discover them to honor the memory of Elisha Gray. 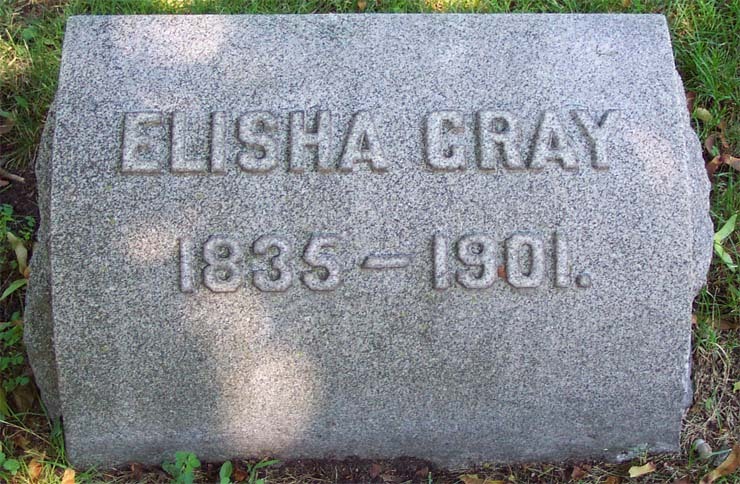 Elisha Gray is buried in the Rosehill Cemetery (Section R, Plat 261). 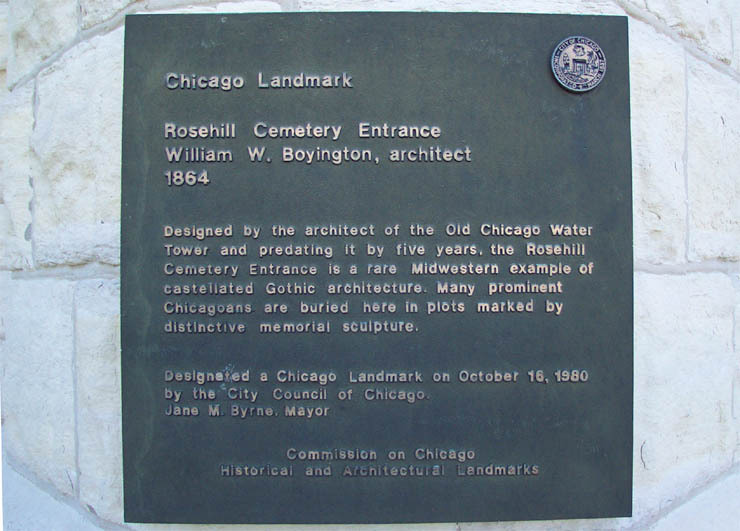 Rosehill (773-561-5940) is the largest cemetery (aerial view) in Chicago at 350 acres with 250,000 people buried there including many famous Chicagoans, e.g., the largest number of Chicago mayors and famous company founders like Oscar Mayer, Hinkley, Schmidt, Sears, Montomery Ward, etc. Check out photos on the web. If you are interested in why I had such a stong desire to find this grave, you can read my brief explanation below the photos. 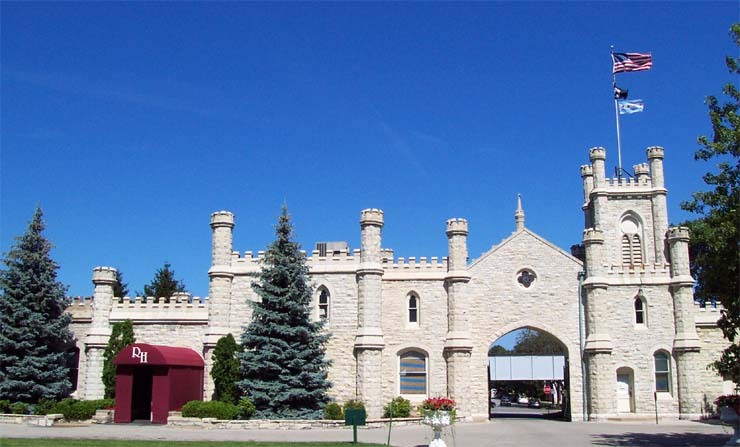 Rosehill Cemetery, largest in Chicago, had this entrance built in 1864. Explanation of the Landmark status and ties to Chicago's historic Water Tower. Back side of the Rosehill Cemetery Entrance. 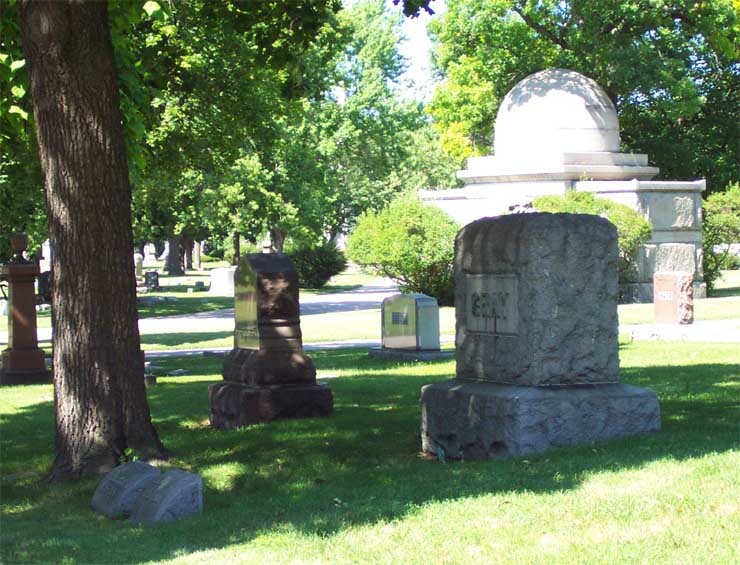 Distant view of the graves of Elisha Gray and his wife, located next to the road. Side view of the Gray family headstone and footstones for Elisha and his wife. 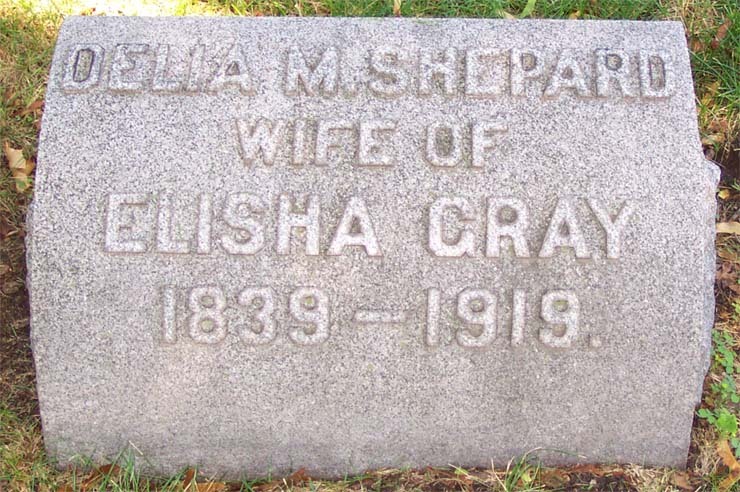 The graves of Elisha Gray and his wife are between their footstones and the Family stone. 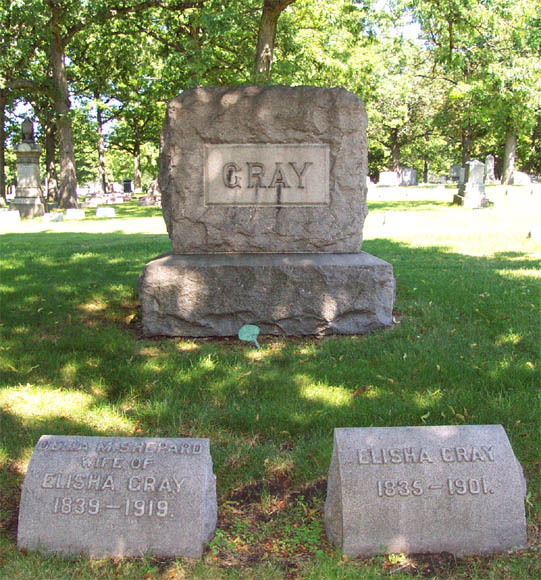 Close-up of the graves of Elisha Gray and his wife. 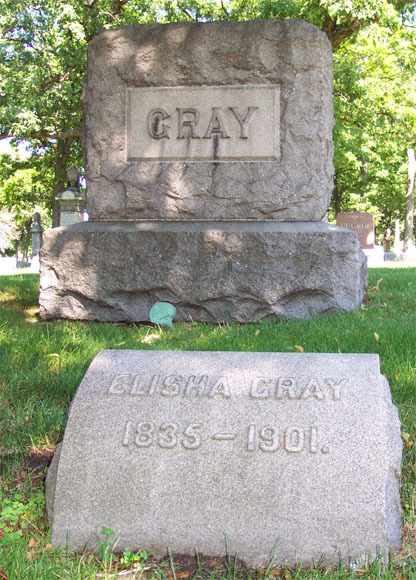 The classic photograph of the grave of Elisha Gray. Footstone of his wife, Delia M. Shepard. Footstone of Elisha Gray. I started my career in 1966 working at Bell Telephone Laboratories, the famous research and development arm of the Bell System. Thirty years later when I retired (for the first time) on October 2, 1996 , I secured special permission, flew to Nova Scotia in eastern Canada and visited the grave, located on his private estate, of Alexander Graham Bell, the inventor of the telephone and the titular founder of AT&T. I owed my career to him so I paid my respects to him. Please read my essay to learn fascinating things about this great man. When I visited the Bell estate in 1996, the grandson of Bell’s driver and handy man took me for a tour including Bell’s grave and shared privileged information with me. At the nearby Provincial Park dedicated to Bell, I saw many inspirational historical photos and displays of Bell’s accomplishments. I was deeply moved when I read the letter that Elisha Gray had sent Alexander Graham Bell. 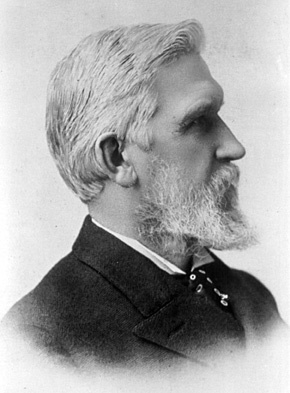 Remember that Elisha Gray was just one or two hours behind Bell at the patent office to file as the inventor of the telephone. In this warm and generous letter, Gray told Bell that Bell was the true inventor of the telephone because he had reduced the concept to practice. Although there have been millions of patents filed, the telephone patent still is the most contested patent, by far, in U.S. history with over 600 suits and Bell won all of them. As was explained above: "When Bell Labs and Western Electric were spun out of AT&T on October 1, 1996 to create Lucent Technologies, Elisha Gray became the titular founder of Lucent." Since I had worked for Lucent Technologies on its first day and then retired, I became the first person to retire from Lucent. 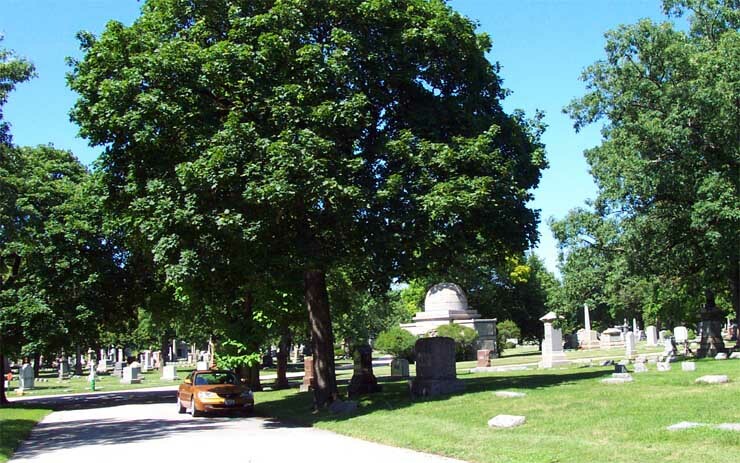 Later I returned to Lucent to work on a consulting basis before retiring the second time on June 30, 2001, thus I wanted to visit the grave of Elisha Gray, the other great man who had made my career possible, and to pay my respects. Copyright © 2002 Donald M. Parrish, Jr. All rights reserved.